Remember our story about crime-related questions being routinely deleted from Alderman Tom Tunney's Facebook page rather than answered? about deleted comments is true. He deleted it. DNAInfo.com runs THIS story today with Tunney's implausible response and reactions from residents. Yesterday, the alderman issued an "explanation." The person who normally oversees our Facebook page was out of the office for the past week and someone else was filling in. During this time, that staffer mistakenly deleted comments that should have remained posted. Alderman Tunney’s policy is to foster positive dialogue and to delete only those comments that are insensitive or personally insulting to other constituents. He apologizes for this mistake, regrets that it occurred and has taken steps to ensure it does not happen again. Anyone whose comments were deleted should feel free to re-post as the alderman appreciates input from all 44th Ward constituents. Baloney. We knew he would delete those crime questions, that's why we took the screen shots in the first place. Note that "that staffer" didn't "mistakenly" delete posts about any other topic. Just crime and policing. In fact, after our story ran, "that staffer" deleted at least one post from a man who asked if our story was true! 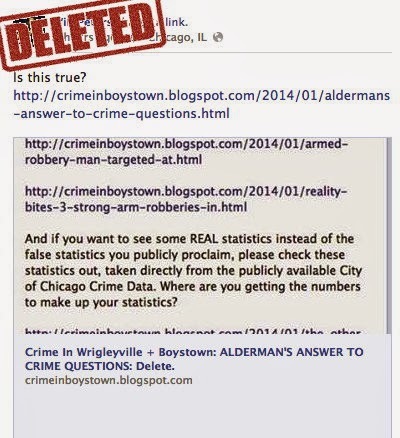 Someone asks if it's true that the alderman deletes crime questions and he turns around and DELETES the question? That's rich. Robberies in our ward have gone up 70% since 2007. SEVENTY. Can you tell us why our district keeps cutting the amount of police officers instead of increasing them?? ?